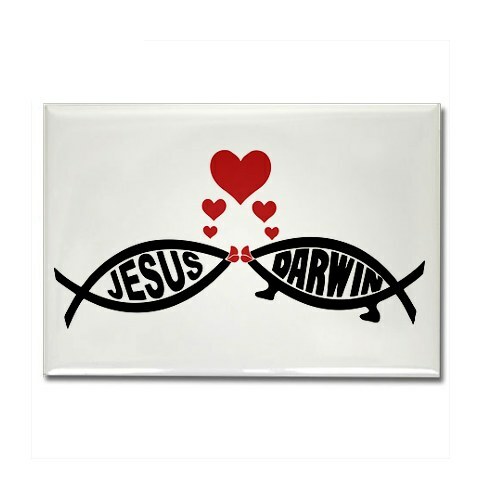 Shuck and Jive: Jesus and Darwin--Love or Hate? Jesus and Darwin--Love or Hate? Creationist Ken Ham along with his entourage, will be in Johnson City this week to spread his superstition. He wrote a post about my church on his blog: Does Elizabethton Presbyterian Church in Tennessee Teach Heresy? I hope you will enjoy that. Dave Hogan and Carl Swann of WJCW 910 AM's Thinking Out Loud hosted Ken Ham today. You can listen to the podcast here. They will interview me about Evolution Weekend tomorrow at 7:40 a.m. Do tune in if you can. I will make sure to post the podcast on this here blog. Also, I am excited to announce that Wayne Winkler of 89.5 WETS will interview Dr. Michael Zimmerman, founder of the Clergy Letter Project and Evolution Weekend, and me between 7:30 and 8:00 a.m. Saturday morning on the WETS Community Forum. Check Dr. Zimmerman's latest article about Evolution Weekend. This interview is timely, as Saturday is the anniversary of Charles Darwin's (and Honest Abe Lincoln's) birthdays. Two of my heroes. What is the difference between Mr. Ham and me? Read more about it at, Why Evolution Sunday? Article in Johnson City Press! Where would the BFTSs in this world be without you, John? God forbid Blogger ever goes down for a day. 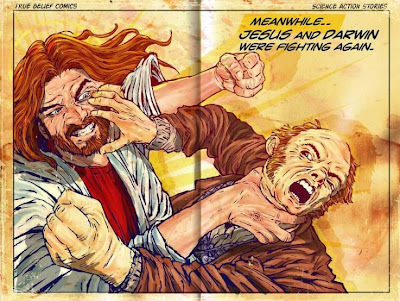 Without your blog there would be silence in all of fundie Christendom! I noticed the next blog entry is "Bill Nye the 'Science Guy' Doesn't Really Know Science." I suppose the one after that is "Alton Brown Doesn't Know Squat About Cooking." I think we should make an arrangement with Ham that each of you get a percentage of the donations that your little lover's spat generates for the other. It would be a Win/Win! @Snad Or "Woodchucks don't know how to chuck wood." I could bring my UU colleague and friend in on it, Jacqueline Luck. So, "minister," was Jesus lying when he told people: "But at the beginning of creation God ‘made them male and female.’" (Mark 1:6)? Because according to evolution, at the beginning of creation, there was no male and female. There was only one single-celled, genderless lifeform. The only possible conclusion from your worldview is that Jesus was a flat-out, shameless liar. Here is the interview on WETS with Wayne Winkler, Michael Zimmerman, and myself. Here is the interview I did with Dave Hogan and Carl Swann on WJCW's Thinking Out Loud. I didn't know Ken Ham was still around. Scary. The Boys Just Want More Votes! Voting on Amendment A This Week! Whoa! Does Every Vote Count! Gotta Love Them Social Workers! Invite Grandma and the Kids! Can A Christian Embrace Evolution? PVJ Responds to "The Boys"